Long, long ago, I sat in a nondescript room with an official leading what was then a grand government project to regenerate a huge area called the Thames Gateway. Her organisation, she said, was supporting London's Olympic bid because it was almost impossible to make anything happen in the Thames Gateway, which extended from east London through south Essex and north Kent to the sea, and only the Games could change this. She was in this position because even longer ago, in the John Major era, the relevant minister, Michael Heseltine, had made a speech christening the Thames Gateway and announcing that Something Must Be Done. So the vast effort of the Olympics had to be enlisted to make some sense of a politician's figure of speech. It was and is a seriously arse-about-face way of doing a bit of regeneration. Over the next 20 years it is hoped to build 8,000 homes around the Olympic Park, in addition to the 2,800 already created by the athletes' village, and to create 8,000 jobs – that is, to make something like a middle-sized market town. In fairness, one should add the less tangible but real benefit of a feelgood factor to a wider area of east London. To achieve all this will have required not only the Olympic billions, but also investment in public transport in Stratford unmatched anywhere else in the country, an additional grant of £290m to be spent on legacy, and more hundreds of millions of public money spent acquiring land. Some of the public expenditure will be paid back as this land is developed, but there are no obligations as to how much or when. But never mind. Not many people now care that Olympic claims for boosting business, tourism and regeneration are tenuous. Opinion polls show that most people in Britain think that £9bn or so is not too much to pay just for the national buzz and joy that came with the Games. So the question is: how can this place so extraordinarily blessed with aspiration and funding be as great as, in theory, it should be? The new homes and neighbourhoods could be beautiful and desirable places that would create new models and set new standards for British house building. The park and venues, such as the Aquatics Centre and the Velodrome, could be genuinely public assets, of easy access to all. Most critically all this has to be done in such a way that the new wonderland doesn't turn its back on its surroundings but genuinely connects with them. Early in the Olympic project, the neighbouring areas were seen as destitute wastelands be erased or shut out, and the main weakness of what has already been built is its lumpiness – the tendency of elements such as the Westfield shopping centre and the athletes' village to turn their back. It would be relatively easy, but a complete failure, to make an exclusive residential idyll here. At the moment, hopeful signs are emitting from the London Legacy Development Corporation (LLDC), the body in charge. Its new chairman, Daniel Moylan, declares that he wants the Olympic Park and its surroundings to be "a very desirable area and we would like as many people as possible to live there". He wants alternatives to "the limited range of standardised products" that large house-building companies tend to produce. He wants property to rent as well as buy, and homes built by their owners. He challenges the common journalistic denigration of Stratford: "This place is not a dump. There are lots of people who are entrepreneurial and enthusiastic." Sensible-sounding management arrangements have been set up for the park and for venues such as the Velodrome, and the Legacy Corporation swears blind that these will not be over-exploited in order to turn a profit. The park, it says, will be open to absolutely everyone, which presumably includes those who might be a bit annoying or unsightly and not good for property values. The LLDC is rightly proud that, compared with previous Olympic cities, London's planning for the future of the site is far advanced, and it has set up an impressive quality review panel to oversee the design of whatever is built. The LLDC has produced a masterplan for the new neighbourhoods that suggests a large proportion of family houses arranged around pleasing open spaces, and with an overall coherence that is rare in regeneration projects. It is planning 29 playgrounds and has made impressive declarations of principle in relation to sustainability, accessibility and design. In the scruffy fringes of the park there has been a change in attitude. Where earlier plans saw them as places to be obliterated by blocks of flats, the idea now is to make the most of what is already there, such as the artists' studios and small businesses and unexpected bits of canal and workshop. Muf architecture/art, a design practice that has helped lead this change of attitude, is now involved in the first of the new residential neighbourhoods, which is a good sign. "Obliteration is not in our lexicon," declares Moylan. They still have some headaches, most notably the future of the stadium. But the real question is whether the current high ambitions can survive the pressures that will come to bear. How inclusive can the new developments be, for example, when changes to housing benefit are likely to push people out of places like this? How kindly will the big house-building companies take to alternative models to their preferred way of doing things? What if progress is seen to be going too slowly and pressure grows for quick results? It's too early to say. For now we can only observe that the masters of Olympic legacy are saying the right things, and wish them good luck. The Post Office's gold-painted postboxes – celebrating Team GB's success – have gone down so well that now we all want one in our town. Has London 2012 set a new gold standard? The most unlikely Olympic artwork of the summer has to be the postbox that was illegally painted gold in Lymington, where Ben Ainslie lives. Did you see the story? A local man was so disappointed to hear no postbox was to be painted gold in Lymington to mark the triumph of the most successful sailor in Olympic history that he did the job himself. He was arrested. But show mercy, for it was the Post Office that came up with the notion of painting boxes gold in the first place. In a plan perhaps reminiscent of Krusty the Klown's Los Angeles Olympics give-away in a vintage episode of The Simpsons, the Post Office vowed to paint a postbox gold for every British victory in the 2012 Games. Krusty promised free meals at his fast-food outlet Krusty Burger for every American Olympic victory, but lost millions when the USSR pulled out and America hit a gold rush. Similarly, our postal providers probably expected to be gilding a couple of postboxes here and there – but instead, their map of gold boxes shows a constellation of customised mail inlets all over Britain. British postboxes have been painted red since 1874. Like our old-style red telephone boxes used to be, they are a renowned national image. Is this the beginning of the end for that red uniformity? The point of the gold postboxes is that they represent a unique variant on a rigid formula. But now, everyone wants a gold postbox. Places that have been honoured want to keep their temporary festive postbox as a timeless memorial – Manchester is already asking for its gold letter receptacle on Albert Square to stay that way as a permanent reminder of cycling success. Red just won't cut it anymore. Those poor towns on the map that have no gold postboxes are surely shamed, as places where no sporting legends are nurtured, where no one's been busy training on the fields of this green and pleasant land. Green and pleasant? Perhaps the grass should also be painted gold in places that have raised Olympic heroes. Park keepers of Britain, where is your patriotism? The London Olympics began and ended with art. The morning of the first day started with people all over the nation ringing all kinds of bells to perform Martin Creed's Work No 1197: All the Bells. But the big art surprise was reserved for the closing ceremony: this mashup of great, bad and indifferent British pop music was set on a gigantic Damien Hirst painting of the British flag. In retrospect, it was always a bit fishy that Britain's biggest modern artist seemed so invisible from these Olympics. It was never really likely that Hirst would let a modest fellow like Creed steal the show. And Hirst's outsized union flag in the Olympic arena unfurled his art at its best: a colossal pop icon. The truth is that art was a bit of eye-candy, or in Creed's case ear-candy, for these Olympic Games. It was inevitable that contemporary British art would be wheeled out as a national asset during this self-celebratory summer. And its strengths were on show: excelling at the pop statement, the public moment. Unfortunately its weaknesses were also apparent, when you compared Creed or Hirst with the athletes, the true artists of London 2012. I don't care how many medals Britain got or any of the patriotic guff that will wash around for a few more weeks. I care about Mo Farah. It's sometimes said of people who are very good at something that they make it look easy. Farah is great because he makes it look difficult. Neither of his gold medals seemed inevitable. Seeing his first victory on television involved and moved me more than any sporting event ever has. It had what I want from a work of art. It touched on deep hopes and fears. It made you, looking at it, aware of the human condition in some deep, primal way. This race – and other Olympic events too – taught me that sport can be profound. By contrast, where is the profundity in Creed or Hirst? Where is the soul in modern British art? It's good for a laugh, a party, a bell-ringing breakfast. But where is that sense of mortal testing and absolute absorption we got from the athletic highlights of the 2012 Olympic Games? Our culture should take a lead from athletics. The real lesson of these Olympics is that the best things in art and life are deadly serious. David Hockney fumed at the opening, Gillian Wearing captured Bolt, and Susan Philipsz mashed up some anthems . . . but what else happened when we challenged artists to respond to the Games? The painter and committed smoker was inspired by a detail in Danny Boyle's spectacular that passed others by: Isambard Kingdom Brunel's unlit cigar – and this in spite of belching chimneys and live soldering. Hockney's iPad painting appeared in last week's g2, and read: "I noticed there was a lot of smoke from fireworks but none from Brunel's cigar. Does this mean that the BBC sees art as directive (unlit) and not reflective (lit)? Debate." People did (look up the comments). The artist who put an artificial sun into Tate Modern's Turbine Hall used one of his own-design solar lamps to pay tribute to the Olympians' speed and dynamism. He wrote: "For me, the Games are about being together, about sharing attention and ideals. They are about feeling connected to people from all over the world, physical engagement and energy. Light generates action: it is as physical as anything you will see in the Olympics." The Turner 2006 nominee picked up on the anxious mood of the early days, before the medal rush. One layer of text in his artwork quotes from the tabloid press ("Historic bronze for our brilliant gymnasts, but please can we have just one gold. Any sport"); the other layer pays tribute to Team GB's eventing horses: Lionheart, Opposition Buzz, High Kingdom, Miners Frolic, Imperial Cavalier ("Do they get medals, too?"). The sculptor, curator and lecturer took a break from a camping trip (location undisclosed) to watch Bradley Wiggins take gold in the time trial. He wrote: "The 30-year habit of summer camping sets me apart from world events. Catching sight of televisions in bars is the kind of glimpsing I enjoy – images, languages and events all arbitrarily associated with time and displacement. The latch on this door will remind me of the warm domestic afternoon in early August 2012 when our friends invited us to watch London as a site of Olympic spectacle. An odd thing if you know the city well, but much stranger if you are camping a long way away." would I finish below Australia? Glover, Stanning and Bradley Wiggins. I ... won ... double gold. Horrors! ... Above Brand GB ... France! The Turner prize 2007 winner was in the Olympic stadium on Sunday 5 August as Usain Bolt crossed the 100m finish line, and took this image (right). She said: "I got into track and field through watching Sebastian Coe and Steve Ovett's memorable races against each other at the Moscow 1980 Olympics. After that, I have never missed the opportunity to be a couch Olympics supporter. I was in row 48 of the stadium, quite high up, but just above the finishing line. This image is just after the 100m final. Both Chris Gatlin and Usain Bolt have cameras trained on them. In the corner of the image, Yohan Blake, the silver medal winner, congratulates Gatlin on his bronze." Not one but two golds to her name. With young Laura and her Bradley hero. The Mearest of lines, the closing line. So, farewell Victoria dearest, you say. You salute her. She runs her last lap, and bows. The last time I'm going to go through that, she says. And even her brave coach is in bits. We knew it would end in tears, the TV says. And they roll down your cheeks too – your armchair, you. The greatest ever theatre – sport's soap opera. Victoria. Oh Victoria. Collect your silver! Your ordeal is over: take your seat on the throne. The sculptor and installation artist took this image of her own living room, explaining: "I haven't been able to focus on art since the Olympics started, not quite managing to peel my eyes away from the TV. After too many days of viewing, gorged with patriotism and pride, I starting to behave oddly … too much information perhaps, too much success. Now I find myself draping my daughter's union flag over the TV in a feeble attempt to blot it out – but in the process I manage to cause a minor marital rift as my enraged husband misses a crucial bit of action." The artist and photographer, newly returned to London from Berlin, took this photograph of an Olympic traffic lane in east London. The lanes are now suspended but will come back into force for the start of the Paralympics. 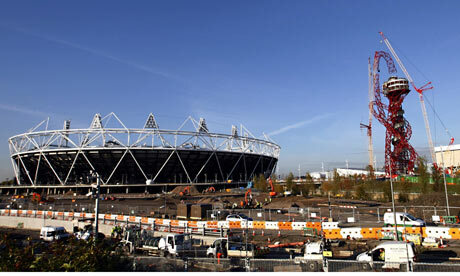 We've seen sporting drama aplenty, but what about the experience of the Olympic Park itself? In between the east London Olympic venues and the roaring crowds is a rolling landscape of brand messages competing for attention. Here, among the restaurants and the merchandise, is the story of how our industrial past became the pleasure grounds of super-modernity. The industrial narrative of the opening ceremony that Danny Boyle dramatised with his dark satanic mills is played out across the Olympic Park, but this time as farce. Britain might have launched the industrial revolution but now we specialise in post-industrial chic. The exposed bricks and rough timber that have become the default visual language of clothes shops and food chains are now just shorthand for cool – to the point where bricks are being exposed where there never were any to begin with. In the Olympic Park, this aesthetic manifests itself as the brick wallpaper in the seafood restaurant and the raw wooden slats on the facades of the two enormous McDonald's restaurants. What's with the sudden design offensive by the Big Mac brigade? If it weren't for the golden arches, these buildings could be mistaken for the offices of a creative industry start-up. My eyebrows first rose at the McDonald's in Westfield shopping mall in Stratford, the retail vortex visitors are funnelled through on their way into the Olympic Park. Here, punters dine on Jean Prouvé chairs. One of the most sought-after designers among collectors, Prouvé designed these Standard chairs in 1934 using groundbreaking metal-bending techniques from the aviation industry. In 2012, they're stylish anachronisms: very heavy and achingly expensive. What are they doing in McDonald's? This is supposed to be junkspace, as Rem Koolhaas termed the mall, not a Vitra showroom. All this good design is confusing. I miss the honesty of McDonald's standardised outlets, those Lego haciendas populated by plastic clowns with red afros. There are, though, more obvious signs of our aestheticising of industry, like that big red thing next to the stadium. I used to think the ArcellorMittal Orbit was just a tangle of steel in search of a meaning, but I was wrong. In Beijing, the sheer quantity of steel in the Bird's Nest stadium was meaning in itself, a statement of a nation's industrial might. Here, it's a display of the fun that our entrepreneurs can have with other people's steel, a giant whoopee for globalised business. Apart from that, it's just a whimsical monument to an individual, our own Ozymandias. Look on my works, ye mighty, and loop the loop. Fleshing out the industrial brandscape, let's not forget that the two Olympic mascots Wenlock and Mandeville are little ingots of steel. Designed by branding agency Iris, this pair hasn't yet captured the nation's heart. In truth, it's hard to be a lovable ingot of steel – especially when you've been crossed with a cyclops. I suspect humans are innately suspicious of creatures with only one eye. And so they're somewhat tragic figures are Wenlock and Mandeville, running and jumping around, blissfully unaware that they're not even cute. They stare out longingly from the shelves of the London 2012 Megastore, like one-eyed orphans. The megastore is the schlock shop to top them all. It's vast, like a mini Stansted airport, and with the same space-frame roof that Lord Foster used – Foster being one of the authors of high-tech, the architectural style of the Olympic stadium, which emerged from Britain's great engineering tradition, itself a product of the industrial revolution. These industrial sheds, or "big box" architecture as the Americans call them, are where real business happens these days – the retail parks and Ikea stores. The speed and cheapness with which they are erected is perhaps the most significant legacy of industrialised building methods, simply because there are so many of them. In the Olympic Park, it's not just reserved for the merchandise stores. The BBC's commentary box sits atop a stack of shipping containers. Meanwhile, the Games's corporate sponsors have thrown up temporary pavilions across the site, decorated sheds filled with Acer laptops, Panasonic plasma screens and BP's sustainability propaganda. As Boyle intuited, everything can be traced back to the industrial revolution, both the glorious Olympic architecture and its ersatz neighbours. Apart from the decidedly heavy Orbit, it's a lightweight landscape where the convenience of the hotdog stand meets the brand messaging of the sponsors. When industry is mostly a memory, the industrial is reinvented either as veneer or a stuffed mascot. And it's a strange landscape indeed where McDonald's plays the arbiter of good taste. The stadium and the velodrome in particular, for their lightness and elegance. Hats off to the people who planted the Olympic Park – Sarah Price with consultants James Hitchmough and Nigel Dunnett – because the grasses and wildflowers are glorious, like a wild summer meadow. These highchairs for the Olympic volunteers are the surprise product of the park – furniture for the broadcasting of good vibes. Just for the sheer entertainment of watching the burger giant attempt to confuse us with its good taste. Cyclopean steel bars – respect to the person who dug that out of their LSD flashback. Merch is merch, but there isn't a poster or photo pin in the London 2012 Megastore that you could bear to own. Whatever you thought of the logo, the way it's been extrapolated into the lurid landscape of wonky signposts and wine bottle labels is just tacky. BMW and Coca-Cola at least put some effort into theirs, but otherwise I can't imagine why people were queuing up for Panasonic and BP's data capture schemes. Granted, the park is geared to heavy people flows, but it's a shame there weren't more gathering places with screens for watching events and medal ceremonies. We produce a beautiful building like the velodrome and then shroud it in fencing, shipping containers and ugly ticketing booths. I was inspired by the triathlon today and the Brownlee brothers to try and write a triathlon myself. So I've written three short poems on three different sporting events today: the javelin, the triathlon itself and two events in the velodrome. I was struck by the idea that sharing somebody's disappointment is as intense and intimate as sharing their success. I used to be a long-distance runner, a Scottish school girl champion, until I broke my leg and didn't walk properly for a year and a half. So I was thinking about that too when I wrote the poem. How quickly we move into our unfit futures! To be thrown into the future: the armchair of a middle-aged woman, watching the Olympics, twenty-four seven, shouting instructions! An ancient Amazonian, her spear spikes the flaky air. Then, out comes Goldie and the great bear of the crowd's roar. Goldie Sayers' words are wise – and the crowd adores. Belief puts itself on the line; hope is not far behind. My tears for her bravery, the biggest surprise. The green-capped feathers all of a quiver. Single swimmers emerge, brothers first – phew! Some say, of this transition) and mount the bikes fast. The road to ambition is a road to perdition. All transitions come with great risks. Possibility of defeat – that's the real deal. As the bird in the river unfurled the swimmers. And they roll down your cheeks too – you armchair, you. Your ordeal is over: take your seat on throne. An estimated 9.6 million people have joined in the free events and exhibitions of the London 2012 festival, the cultural side of the Olympics, including 2.9 million who rang bells to mark the start of the Games. Church, cow and bicycle bells were rung as part of Martin Creed's extravaganza which launched the event 10 days ago, Work No 1197: All the Bells in a Country Rung as Quickly and Loudly as Possible for Three Minutes. The London 2012 festival and Cultural Olympiad director, Ruth MacKenzie, said audience numbers were running "well ahead of expectations", with at least another 5m free places to come, and the explosion of arts in the Edinburgh international festival included. Ticketed events have already taken attendance to more than 12 million, with more than 2m tickets sold, and the figure is expected to rise as full audience statistics are compiled. The festival, the culmination of the Cultural Olympiad, began on 21 June, and will continue until the last day of the Paralympic Games, 9 September. Major free events still to come include Neil Mullarkey's attempt to create the world's largest improvised comedy event in Barnsley next Friday – free but tickets must be booked in advance; YesYesNo – Connecting Light, a line of pulsating colour created using LED bulbs inside weather balloons along the length of Hadrian's Wall; another light-in-the-darkness art installation up the steep slopes of Arthur's Seat in Edinburgh; and many free events in Happy Days, a new festival of the work of Samuel Beckett in Enniskillen in Northern Ireland, where the Nobel-prize-winning playwright went to school. The opening event of the Happy Days festival, which will continue in future years, is a free concert titled Play It Again For Sam. "We are cautiously pleased with ourselves," MacKenzie said. 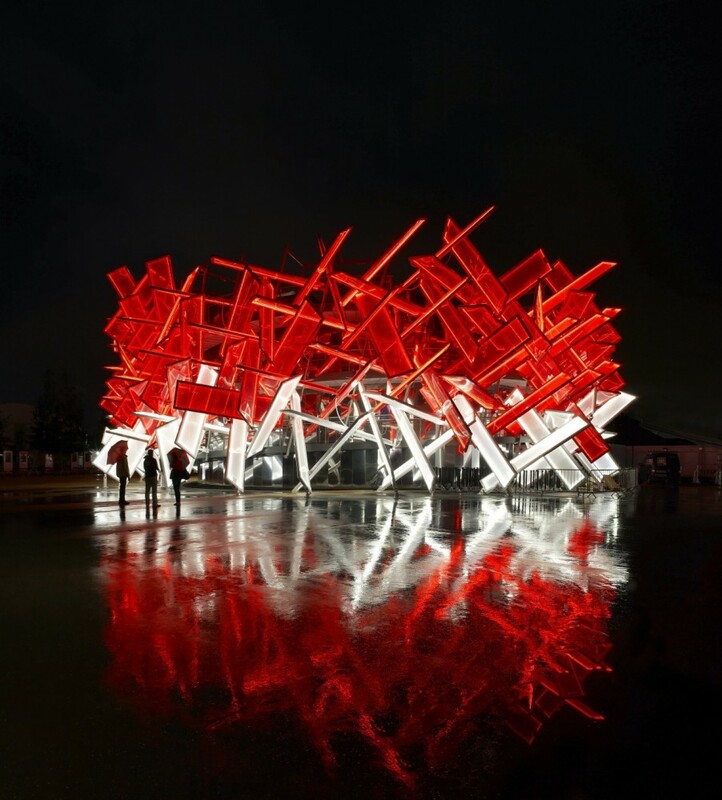 Which Olympic artwork takes gold? Myron, Thomas Eakins and Jean Metzinger all created memorable images of athletes – but which best represents the heroism of sport? The Olympics are wonderful and got me thinking – what are the best representations of Olympic sports in art? The Discus Thrower by Myron takes some beating. In this ancient Greek sculpture, copied many times and remembered down the millennia, the perfect athlete prepares for the perfect discus throw. This Greek youth could easily perform in the arena at Stratford and no one would bat an eyelid – so recognisable is his peak-fitness form as he swings that discus back. The Discus Thrower may seem the unbeatable gold medallist among Olympic artworks, but it has some younger rivals challenging for the top spot. The American artist Thomas Eakins was a powerful realist whose paintings concentrate relentlessly on moments of psychological and physical challenge. His 1871 picture The Champion Single Sculls (Max Schmitt in a Single Scull) is a coldly glistening view of the Schuylkill River in Philadelphia. Water and sky mirror one another eerily. The river is an unfriendly silvery pane of glass. Alone in his low thin boat, a pale athlete looks back at the artist. Max Schmitt was a champion rower and friend of Eakins. This strange portrait of him captures not the glory but the loneliness and tension of the sportsman. This rower seems weighed down by the challenge of his sport. It is a great image of the mental as well as physical endurance we see in the Olympic Games. Another American painter, John Frederick Peto, also conveys the anxieties of competition in his painting The Cup We All Race 4. This eye-fooling image, painted around 1900, depicts a battered tin cup hung on a wall: it mocks the value of what runners and rowers and everyone else strives for. Jean Metzinger's 1912 painting Au Velodrome is a cubist homage to the modern world. For Metzinger, cycle racing is a quintessentially 20th-century theme. The fusion of man and machine, with human energy driving it all, captivates him just as it inspires today's cycling fans. In fact, this is a very contemporary image – Metzinger's analysis of a cyclist's prowess is very much in the spirit of the star cyclists of 2012. This is a pure celebration of athletic energy and the thrill of sport – a modernist version of the Discus Thrower. It's a strong field, but who gets gold, silver and bronze? Peto disqualifies himself from the medals by mocking competition. I would give bronze to Metzinger for his exciting but slightly soulless portrayal of a cyclist at the Velodrome. Myron's Discus Thrower, one of the great Olympic art champions, takes silver this time. For me, the gold medal has to go to Thomas Eakins for capturing the loneliness of the single sculler. He lays bare the soul of the sporting hero, and conveys the psychological intensity that makes a victory like Mo Farah's in the 10,000 metres on Saturday so compelling and profound. but me I've got gold medal anxiety. Brand GB is made of finer stuff. doctor doctor give me a diagnosis.